This week we were meant to be sun seekers! We've been having fabulous weather so for Sally Russick of the Studio Sublime to send us out, well no problem! While I did get out in the sun I didn't take my camera with me, oops problem. My favourite part of a sunny day is always feeling the warmth on my eyelids on the rare occasion I take my shades off. Not the best picture I could think of. 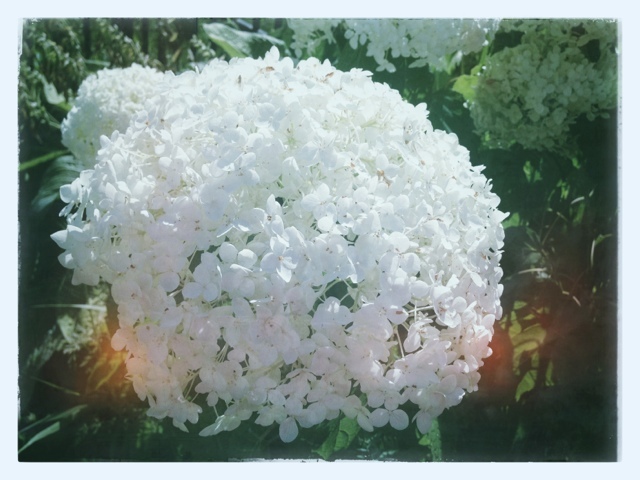 Instead, I saw my beautiful hydrangea, which makes me think of the summer sun and weddings. My mum and I did all the flowers for my wedding. Masses of hydrangea and tulips all in white - beautiful! That word, potourri, makes me think of Jeopardy! where they use the term for their grab bag of “answers” that have nothing to do with each other. It was a let down category and everyone mispronounced it making it doubly irritating. A bit of this and a bit of that is, well, what I’ve got for you today. Hmm regretting my opening a tad. I designed a quick fix business card for occasions when my pretty moo cards aren’t appropriate. This prints on a 4x6 print, so one-hour photo means I can get them very quickly and at a great price (hello $3 for 120 cards). I think I may try out some other versions for earring cards perhaps. I’m not sure why I didn’t think of this sooner. I rescued the remnants of my poppies, those wonderful pods (same plant as the picture above) and I hope they hurry up and dry out so can make something with them. I see resin in their future. Oh yes, I’m having a little love affair with resin at the moment. All sorts of ideas in the works, can’t wait to share more. I have these little charms, or small pendants, that will start heading into the shop tonight. If you are stopping by the shop be sure to use coupon code ALLWINNERS20 for 20% of your order, it’s good through the end of July. Which somehow, is just around the corner. Welcome to the hop for those of us you get wonderful little beauties to create with and then lock them up for years since they are too precious. What a flawed statement that is! Thank goodness for Lori Anderson and her inspiration to get us all to own up to our unreasonable behaviour and get these gorgeous beads into creations and on to bodies to be seen! I’ve got all sorts of wonderful things housed in my equally wonderful Hamilton cabinet, I promise it isn’t full. My first plan was to use these stunning lampwork hollows (on the right in picture below) from Wandering Spirit. I can remember Aja was listing new beads and I asked if she had any blue tones coming up. She sent over a picture and I declared MINE! That was 2009. This is a case of my design exceeding my skill level. I have visions of some scrolls of hammered wire, but it seems just a bit out of reach. I’m keeping them on my worktable for when it all slots into place. Last August I shared some hoarded beads even as a way to get me to make something with them, and still they sat. If you thought 2009 was bad, then perhaps I shouldn’t mention those Humblebeads are from 2007! The Marsha Neal Studio pendant is from 2011. Can you tell I have a thing for blue and brown together? On to what I made and pictures in daylight! First up I was determined to use that gorgeous blue Acanthus leaf, William Morris inspired polymer lentil. I can remember Heather talking on her blog about using William Morris as inspiration in some red tone beads first and then stalking her blog and shop when she said there would be blue coming. I love William Morris. Here is the wrap bracelet I ultimately came up with. At first it was going to have all sorts of dangles and it just didn’t feel right so I took it back to simple wire wrapping it with big loops either side and then wrapping on these smoky quartz flat brios, a little swarovski, and one lonely teeny pearl. I wrapped them in such a way that there is just a gentle sweep, so fitting with the beauty of this bead. I added a fairy silk from Marsha Neal Studio and it is a perfect fit and so me. I immediately thought, why didn’t I do this years ago?! Next up I had a pile of dangles from those earring pair beads and the stunning pendant so I got to work on a necklace. More silk from Marsha, ebony wood beads, more smoky quartz, some pearls, a little antique agate and then the final touch – a button from Sheppard Handmade, tied on with waxed linen. It’s a bit odd the way the silk loops back around, but I felt like the resulting negative space was a little Morris-esque. I’m letting it soak in a while, see if this configuration is really wearable. For the clasp I found this Vintaj piece (while searching for another) and opted to use a stick pearl with it. Thankfully it was just the right size and this feels nice and secure. At this point I was feeling pretty good for creating two pieces the night before the hop and not panicking about how my original plan was well and truly out the window (I didn’t need to confess that I could have made this be the plan all along)! Then I decided to go for broke and make earrings with the last pair of dangles I had at the ready. I was going to just hang them on ear wires and be done, but I heard a little call from the Cabinet. Ok not really. But there was an awesome pair of hearts from Claire Maunsell of Stillpointworks hidden in there that needed to come out. I had picked them up from Claire in person and recall her asking what I was going to do with them – I more than likely confessed I planned to hoard them. I am far too impatient to take pictures of earrings hanging, they never seem to stop moving! Three pieces, I can hardly believe it! I am also surprised that I am not showing you anything I made to go along with these lovelies. Perhaps that was what was right all along, keeping my own polymer out and letting the work of these four ladies do the real talking. As I was taking the pictures I was thinking about this hoarding, and how I hoped I wouldn’t offend anyone with this casual usage of the term. You see I come by my collecting of gorgeous handmade things honestly. That cabinet, my “Chiffonier” that you see was made for me by my dad when I was in my teens. It’s pine but with a white wash pickling stain that stops it going orangey. Since the stain is sold in gallons, like paint, I ended up with this cabinet, a side table and a buffet. Which was a lot of furniture to add to my childhood bedroom, but in my house now looks wonderful. Dad hoards good looking wood. Mum is a sewer and embroiderer so her stash of fabric and whatnot will rival anyone's. Perhaps we shouldn’t get into my pottery stash, as I notice two pieces in the photo. No, let’s get back to bead hoarding. I couldn’t resist this stunning lost girl bead from SoulSilver, blue and paisley, I’m simply powerless. However I did have a little plan in mind that something special would be needed for those polymer beads top right. They were made by my daughter Averleigh, about six months ago. She is three, so I cut the holes but that’s it. The pendant at the bottom I had made after she was born and I tought a big silver loop of sorts at the bottom of the girl – charm collector style - may be the way to go. I’ll let that idea sit a few years. Thank you so much for joining me on this journey. 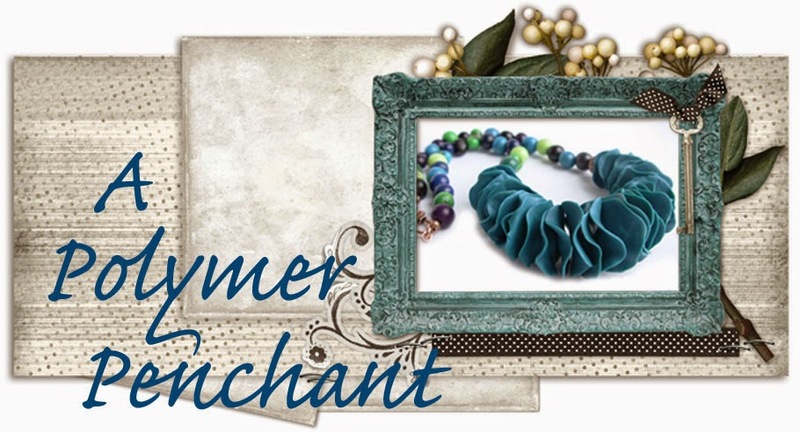 Thank you Lori, for finding new ways for me to stretch my skills and get some jewelry made! I hope you will hop around and see all the amazing treasures that everyone will be unearthing today! If you are here for the bead hoarder’s hop I expect to have that post up midday Saturday – love to have you back! Well, week 29, I find myself writing up a blog post to share and it just dawned on me that this is a new routine this year. Oh there are so very many routines when you are raising a little one. That first year plus full of strict routines for sanity. Averleigh likes to have things in their place, she really enjoys her parts of routines, like turning of the lamp, closing the door, and on and on and on. I know that if I interrupt any part of the various sequences I will suffer. All these thoughts felt a little mundane, not up to the standard we see when Sally sends sweet prompts about finding the special bits. Wednesday morning I hear “me-meow”. In that moment I realize that is the same meow I hear every morning I sit down at my work desk and turn on the computer. [ My day job is customer service and I do it from my home]. Roxy knows there is a toy on my desk, a stick with an elastic string with a feather-bell-fluffy thing on the end. She will wait there for a solid ten minutes just waiting if i don’t respond right away. She has her fun and then curls up and sleeps a few feet away all morning while I work. I thought I hadn’t posted her picture before, but sure enough week 6 there she is and that’s the keyboard tray in the background. Ah man, I’m repeating myself! But she’s still cute. Catch up with the rest of the gang finding the highlights of the daily grind over at the Studio Sublime. I’m a bit late posting since I was working on a craft show Saturday. I had planned to post Saturday night but fell asleep instead. But I really didn’t want to miss a week of these wonderful prompts we get from Sally Russick of the Studio Sublime. This week was all about catching the patterns in our daily lives. Here is a small snap shot of the back of my booth display. There is a canvas in front of this metal commercial wall art that looks like a stand of trees. I have two of these that sit in a block of wood, hinged together, great for holding all sorts of things. I was excited to cover them in the blooming flower pendants I shared in my last post. It’s tricky to not get disappointed when they didn’t get much attention. Oh well. That wasn’t the right audience I tell myself. Tricky to not get disappointed when a lovely venue, full of wonderful vendors, on a glorious day doesn’t draw much of a crowd. That is a pattern I hope isn’t developing. Alas, much better to focus on the pretty patterns that are clear and not so much on the ones that are vague and beyond my control. The real reveal is over on Brandi Hussey’s Brandigirlblog and it sure is full to the brim with wonderful colour. Brandi is celebrating the launch of her new book Understanding Color and I wasn’t about to miss the party! I was lucky enough to jump on the pre-order so I have a digital copy, and this week my hard copy came. I also had the treat of a palette print in blues and greens which I love and would look wonderful in any room in my home – how did she know!? I’m borrowing Brandi’s shot since she put the palette along side oh so nicely. I almost didn’t enter since I had a grander scheme in mind and time just ran away from me this week with plans changing on the fly. This is part of a new polymer series I’m working on. New textures, impressed in polymer, colourized and then resin overtop. Usually if you are working with resin the goal is to eliminate bubbles. I like the oddity here that the deep impressions allow for the bubbles to stay, I hope they appear as a feature. It is a great big mess of colour in my studio at the moment, but I really am liking how things are turning out, if I do say so myself! Now I fully intended to use this palette, #2, for the challenge – isn’t it just stunning! That blue on the right end is very close to what I consider my very favourite blue. I was most assuredly working in this vein, just didn’t manage to snap a picture in time for the deadline. I’ve also been trying really hard not to forget that yellow, orange and red should appear in my work from time to time. I am certainly looking to my new book to help me along that journey as I would like to be more purposeful in my colour combining. Thanks so much Brandi for letting me join in on the fun! I’m about half way through reading Understanding Color and I just love how accessible Brandi makes the theory. I’ve paused to digest a bit but am excited to have the resource at my worktable. I work with polymer clay, it’s a very tactile experience pretty much all of the time. I’ve been experimenting with different surface techniques since it’s a lot of fun. Hold that thought. Last weekend we visited the Lachute flea market and on the way home, with Averleigh napping in the car, we stopped at a Scrapbooking store I had caught a glimpse of on the way there. Scrap en masse as it turns out has been about 45 minutes from my door for six years. My husband and I can’t agree on what that translates to in English, but their website gallery shows the vast plethora of media available. It was the best and worst thing that I had left my credit card at home and was limited to the funds left in my pocket. I had a good look around before picking out a few things. I saw the wall of PanPastel and immediately recalled a certain talented polymer (and glass) artist from Gatineau (who shall remain nameless) and her almost giddy “oh have you tried these – here feel!” I do believe art supplies are more addictive than crack. Oh the colour! I only had enough on me for two colours and I must have stood there for a solid ten minutes trying to decide, practical shades, punchy ones, or practical and punchy. Screw it, pick what you love! A little work in progress, some textures I was working on already were willing subjects. Oh my, the feel of that pastel on my finger, they are indeed as advertised – ultra-soft. I’m sure you are supposed to use a sponge tool, but I just had to touch it, feel it…I swear I did not snort it. Head on over to the studio sublime to see all the textures being shared.